Definition at line 1104 of file shellclasses.h. Definition at line 1106 of file shellclasses.h. Definition at line 489 of file shellclasses.cpp. Referenced by ExtContextMenuHandlerT< ShellBrowserChildT< ChildWindow > >::WndProc(). Definition at line 503 of file shellclasses.cpp. Referenced by DesktopShellView::DoDesktopContextMenu(), and ShellFolderContextMenu(). Definition at line 483 of file shellclasses.cpp. 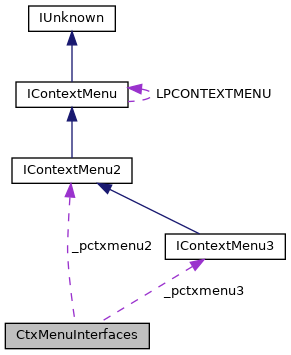 Referenced by CtxMenuInterfaces(), DesktopShellView::DoDesktopContextMenu(), query_interfaces(), and ShellFolderContextMenu(). Definition at line 1115 of file shellclasses.h. Referenced by HandleMenuMsg(), query_interfaces(), and reset(). Definition at line 1117 of file shellclasses.h. Referenced by HandleMenuMsg(), query_interfaces(), reset(), and ExtContextMenuHandlerT< ShellBrowserChildT< ChildWindow > >::WndProc().